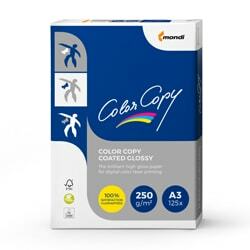 Color Copy Coated Glossy is designed specifically for use on colour laser printers and copiers. A specially adapted double-sided coating for digital colour laser printing gives brilliant colour reproduction and the highest quality printing on both sides. This coating gives the paper a unique gloss effect which can be used in digital colour laser printing to produce needle-sharp prints of the very highest quality on both sides of the paper. It is suitable for the highest resolutions and combines perfect flatness with flawless sheet formation for optimum toner transfer. Glossy paper can enhance the overall impression of important documents and is ideal for brochures, leaflets, flyers and presentations; with the card weights being ideal for brochure covers. A combination of the perfect paper with high gloss ensures you have the winning formula to make your documents stand out. Guaranteed for use on mono and colour laser printers and copiers.